Total Social – Wisdom from Bob! I cant believe I missed my Confessions post yesterday. Life was a little too busy the past couple of days to get to it. The theme of the Total Social link up this month is “Favourite Things”. You know what’s weird about me? If you give me a broad category and tell me to choose my favourite thing, I cant do it. Favourite food? I can’t choose one but I will say there are a lot of things I love to eat. Favourite drink? Again I have a few favourites and I’d feel like I’m cheating. Favourtie book? Impossible for me to choose because I have so many I can read a thousand times. You get the point. When I narrow it down though I find that its much simpler. I love quotes, but if you were to ask me what my favourite quote is, I wouldn’t be able to choose one. What I can do however is tell you my favourite quotes from a particular person or a particular movie or time. Thumbing through my phone yesterday, I stumbled upon my favourite Bob Marley quote and I thought I’d share it. Its so relevant in my life right now that it probably would have gotten posted today anyway. I love this quote and this has been the theme of my year. Throughout this year, which has been a rough one, I’ve found strength I never knew I had and I’m very grateful to know that I have that kind of strength in me. When I stumbled on the image, I sent it to one of my friends who has to have surgery next week and who is just having a rough go at life right now. I reminded her that she will find strength to get through whatever she needed to. Its true what they say, when you think you are at your weakest point, you somehow find the strength to push through. 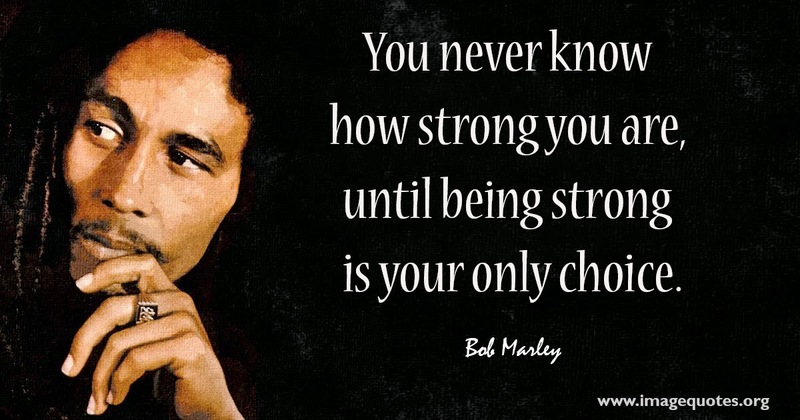 Just thought I’d share this little piece of wisdom from old dreadlocked Bob. Previous Post Wardrobe must haves!